Developed over years of careful research and clinical trials, Magnitropin™ offers a high-performance testosterone booster and myotropic agent. Magnitropin™ uses a combination of scientifically proven ingredients to help you build lean muscle mass, increase your endurance and appetite, boost your strength and improve your overall athletic performance. 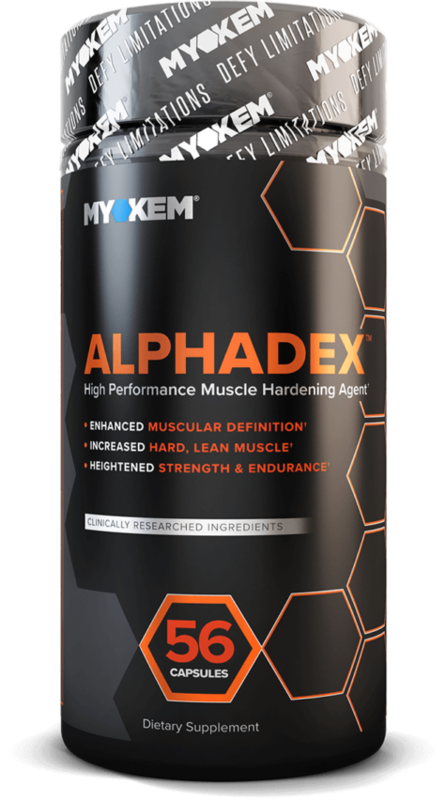 The advanced formula allows you to build healthy, toned muscle mass safely and efficiently. As a dietary supplement, take three (3) capsules of MagnitropinTM twice per day. For best results, take one of your daily servings either before or after a workout. Can be taken with or without food. 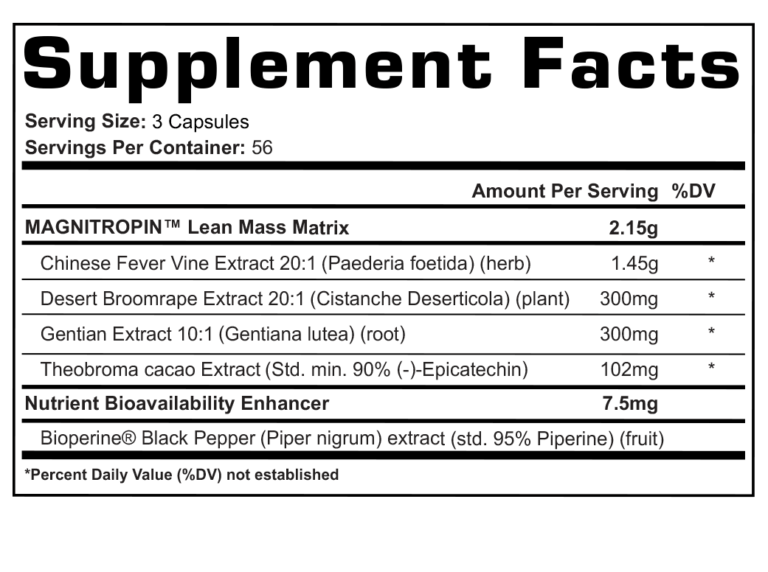 Do not exceed 2 servings per day (6 total capsules). Drink at least 8-10 glasses of water daily while taking MagnitropinTM. For best results, it is recommended to take MagnitropinTM continuously for 8 weeks, followed by an off-period of 2 weeks. Each bottle lasts for a 4 week cycle. 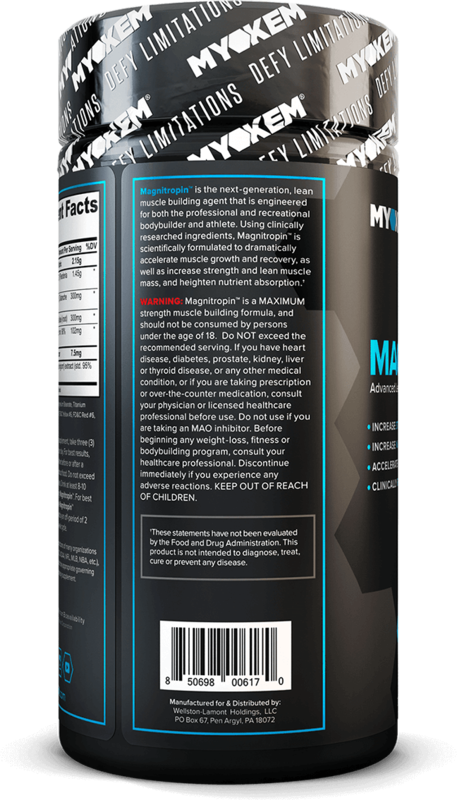 MagnitropinTM is a MAXIMUM strength muscle building formula, and should not be consumed by persons under the age of 18. Do NOT exceed the recommended serving. If you have heart disease, diabetes, prostate, kidney, liver or thyroid disease, or any other medical condition, or if you are taking prescription or over-the-counter medication, consult your physician or licensed healthcare professional before use. Do not use if you are taking an MAO inhibitor. Before beginning any weight-loss, fitness or bodybuilding program, consult your healthcare professional. Discontinue immediately if you experience any adverse reactions. KEEP OUT OF REACH OF CHILDREN. 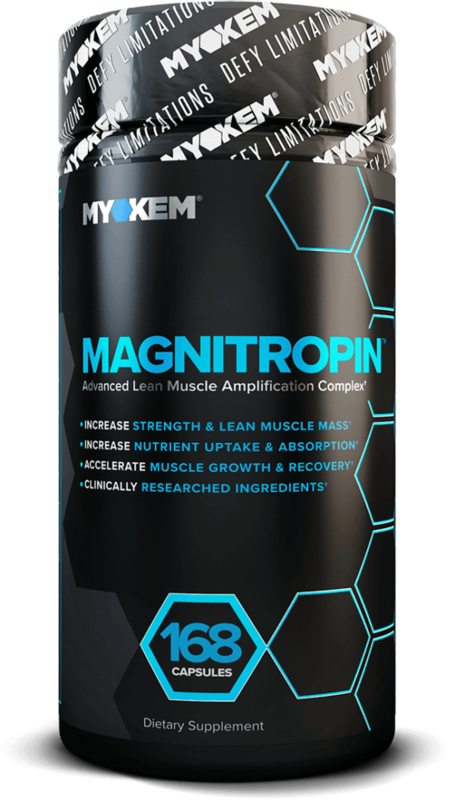 Magnitropin™ is an effective test booster and muscle mass accelerator thanks to its unique formula, which combines several ingredients that complement each other to enhance individual effects for a greater overall result. 1.45g PAEDERIA FOETIDA EXTRACT: Paederia foetida is a plant that goes by various names, including Chinese fever vine, and is the best test booster. 300mg CISTANCHE DESERTICOLA EXTRACT: Cistanche deserticola extract has been found to improve muscle recovery, strength, and endurance. 300mg GENTIANA LUTEA EXTRACT: Gentiana lutea extract improves your digestion while stimulating your appetite, encouraging greater food intake to fuel growing muscle mass. 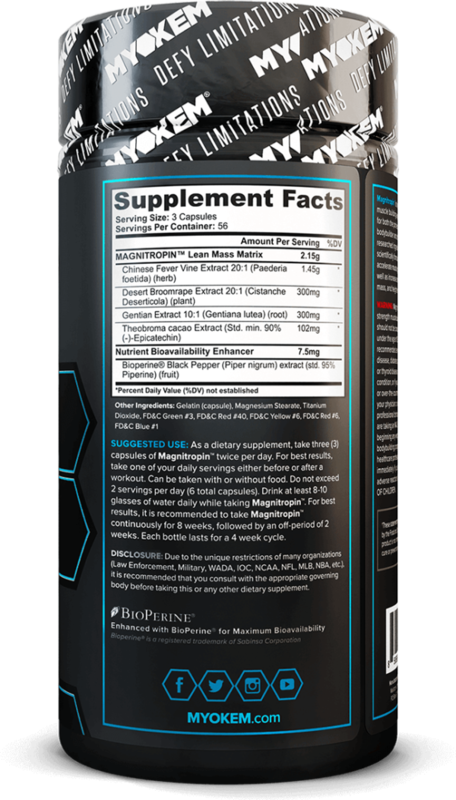 102mg EPICATECHIN: Studies suggest that epicatechin has been found to increase your resistance to fatigue and can effectively promote muscle growth and increased strength by stimulating muscle protein synthesis. 7.5mg BIOPERINE® BLACK PEPPER EXTRACT: Black pepper extract is a potent source of piperine which allows supplements to spend the right amount of time circulating in your body.